The esteemed food writer Michael Pollan said it best : Eat food, not too much, mostly plants. Starchy carbs are not my enemy, but I do feel better when I stick with Pollan’s suggestion to let plant based foods become the star in my meal planning. There is no substitute for my beloved potatoes and they are always welcome at the table. 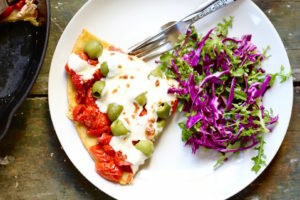 Grain based products like pizza and breads are an occasional craving, so replacing starchy grains and enjoying a quick bread made with almond flour, or this pizza made with chickpea flour, is the way I choose to enjoy the things I love. Chickpea flour (besan at my local Indian mart) is now easier to find at most grocery stores, and it keeps very well on the shelf. Socca ia a street food common to Southern France, with outdoor grills set up in small towns for cooking the chickpea flour flatbread to a smoky char, brushed with olive oil and eaten as is, not with toppings like today’s pizza recipe. A nicely seasoned cast iron skillet is ideal for making a socca with crisp edges; preheating the pan at high temp will help, too. If pressed for time, you could use jarred tomato sauce, but you’d be missing out on the wonderfully fiber- loaded- pleasantly chewy roasted baby tomatoes, redolent of garlic and fruity olive oil. When tomatoes are in season, use my slow roasted tomatoes with garlic and herbs. I could see this recipe veganized with your favorite vegan mozzarella. Or decorate with dollops of my Smoky Vegan Cashew Cheese. Don’t care for olives? Nearly anything will substitute, like capers or pickled peppers or roasted sweet peppers. This makes a light lunch or brunch, easy weeknight dinner (make the roasted tomatoes ahead, and even consider making the socca crust ahead and topping just before baking for your meal) or weekend breakfast. In the great feature film of life, plants have the starring role. Everything else is like supporting cast, with variety among the players offering the best and tastiest cinematic experience. Whisk together chickpea flour with water, 1 ½ tablespoons olive oil and fine salt; allow to sit at room temperature at least one hour and up to several hours. On heavy large non-insulated sheet pan (avoid insulated pan which will poach/steam but not caramelize well), use clean hands to toss together tomatoes, garlic, 1 tablespoon olive oil, kosher salt and red pepper flakes if using. Arrange cut sides of tomato facing down to get better caramelization. Roast for 20 minutes and carefully remove with spatula to a bowl or plate to cool; may be made up to 2 days ahead. Increase oven heat to 450 degrees; place heavy 10 inch cast iron pan (or other ovenproof heavy skillet) in oven for 10 minutes. Using very sturdy oven mitts, remove pan from oven and swirl the final tablespoon of olive oil to coat the pan, add the rested chickpea batter and use an ovenproof spatula to spread the batter evenly to the edges of the pan. Increase heat to high broil. Top socca crust with roasted tomatoes, then green olives and then the mozzarella. Broil for about 3-10 minutes or until cheese is puffy and slightly charred. Serve immediately.